culture revealed through the explosion of detailed cosplays, along with unique hand-crafted items that popped up all around the convention. I typically make it my mission to attend each year, and that was not going to change this year. C2E2 2019 helped motivate me to keep the tradition going, and I can’t wait to come back next year! One of my favorite parts of going to Artist Alley is seeing familiar faces and getting introduced to a few new ones. Someone who I look forward to seeing at C2E2 and Chicago conventions is Jane Labowitch, better known as Princess Etch a Sketch. She is one of a few artists who create all their work on an Etch A Sketch. I have been admiring her detailed work through Instagram since about 2016. Her level of detail is truly outstanding, and I admire the effort she puts forth to make her fans happy. I grew up loving the childhood toy but had not discovered the amazing things that could be done with it if I took some time and turned both knobs. During last year’s C2E2, I was able to meet her and her art face to face. It’s extremely cool to observe a talented person express herself through such a fun medium. She had many prints, buttons, stickers, and original renditions for sale and to view. In addition, she also held a family workshop which showcased the work she does, how she does it, and taught others the basics of her craft. She always greets fans with a friendly face and amazing art. If you do not have a chance to see her at the Chicago conventions, I highly recommend checking out her art here. One of the new faces I was able to see was none other than the award-winning author of one of my favorite franchises Scary Godmother, Jill Thomson. She had a booth in Artist Alley and had a large line of people ready to meet and greet the talented artist. Her books always were a favorite of mine to read and although I did not get much of a chance to talk with her, it was a very cool experience getting to see her in person. There were amazing artists throughout the convention, including those who work directly with the convention. At the front gate there was a talented shirt maker creating, customizing, and selling customized T-Shirts pressed by hand in front of his customers. You could pick color, size, what design, add designs, and get to watch the artist at work. For a very fair price, this was the perfect place to get something unique to remember the convention by pressing and printing them for the viewer to see. con floor. I always look forward to seeing the wide variety of Pop!s old, new and in-between. Many had mystery bags, giveaways, and more, but my favorite part of these booths was getting the opportunity to meet fellow Funatics (Funko collectors), whether it be from those looking around, working the booth, or those looking for something specific. I was able to spot some grails (rare/exclusive Pop!s) that I had not seen before, and even though I did not get them, it was super fun to bond over searching for these collectible pieces of plastic. 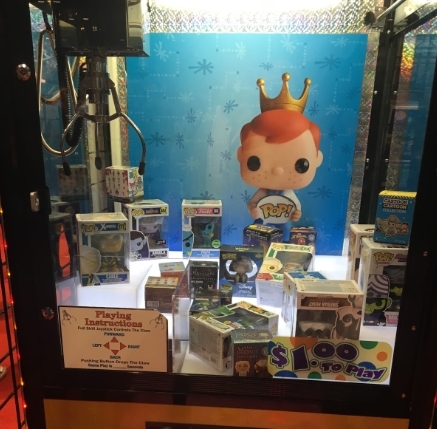 Conventions like C2E2 have something to offer for all types of fandom, including Funko Pop! collectors. like that fills me with joy and pride. Despite not attending any panels, or setting up an autograph session, I had a great time exploring and roaming the con for the day. I can’t wait to do it again next year!